Well the holidays are past us, and we survived! I love Christmas and New Year’s, because it’s a time for friends and family to come together, give gifts, celebrate life and a new year, and indulge in our favorite foods. But now that it’s over, it’s time to kick off the new year with a healthy kick. But dang is it cold! So I knew I needed healthy comfort food, which is where Cauliflower Chowder comes in. This recipe kept popping up for me on Pinterest from the Damn Delicious site, and I knew I had to try it. First off, I am loving the recipes from this site, as I also found the Baked Broccoli Parmesan Dip from last week from it. What really grabbed me about this Cauliflower Chowder was that it a great low carb soup, and if you follow me on Instagram, then you know I LOVE my carbs…I’m talking to you “Mound o’ Mashed Potatoes”! 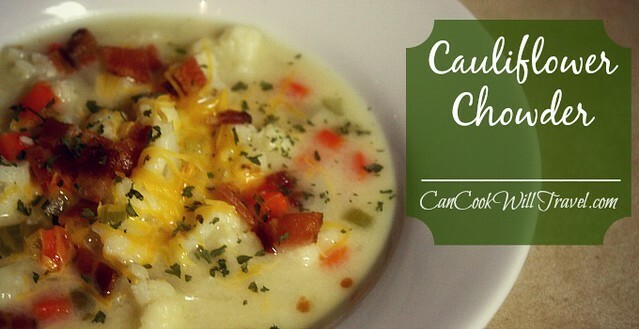 What happens is that a head of cauliflower takes the place of the traditional potatoes in the chowder. 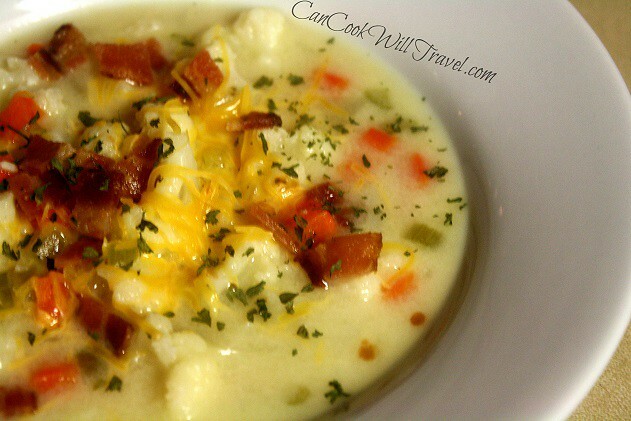 Now this chowder was delish and super easy too. The longest part, as always, is the prep work. I started off cooking 4 slices of bacon, which I did on the NuWave oven, but you can cook them up using your favorite method. While the bacon cooked, I cut the cauliflower into small, bite-sized florets. Then I diced an onion, 2 carrots, and 2 stalks of celery. By then the bacon was crispy, so I just chopped it up. Then it’s time to put together the soup by melting some butter and then sauteeing the onions, carrots, celery, and minced garlic for a few minutes until tender. Add in the cauliflower and a bay leaf and cook until the cauliflower starts getting tender. Add in some flour and whisk until it’s mixed in and slowly add the liquids in the way of milk and chicken broth. Bring to a boil and then simmer for about 12-15 minutes. Add in some salt and pepper to taste, and you’re ready to go! No chowder, in my mind, is complete without some extra fixin’s. This of course started with the bacon, then because I didn’t have fresh parsley I settled for some dried parsley for color, some shredded sharp cheddar cheese, and last but not least several dabs of hot sauce. This time I went for a Garlic Pepper Tobasco sauce, which was a perfect hit of heat that also goes well with the garlic flavor in the soup. So if you’re looking to start the year off on a healthier kick (and who isn’t? ), then be sure to add this recipe to your list. Lighter comfort soup that is a great low carb option. And it’s easy to customize too! Hope you are having a great start to YOUR new year! Click here for the recipe and step by step instructions! Two years ago: Hearty Minestrone Soup…Take that Winter! Three years ago: Linguine with Clam Sauce…Absolutely Delicious!